The UK’s recent referendum on whether we should stay in the EU produced a shock result that has led to political and economic turmoil on an unprecedented scale. The VUCA acronym (Volatility, Uncertainty, Complexity, Ambiguity) has never felt more apt in this country. This is not to say, however, that all is lost. The organisations that will survive and prosper are those who are well-prepared for change and who can focus on it positively. The real key to successful change, of course, is people. In uncertain times, learning takes on new significance in terms of helping people to adapt to new roles or new ways of working and giving them the skills they need to be successful. Investing in the development of your people also shows them that they are valued. This positive message can relieve the stress of insecurity and help focus them on the organisational goals and the tasks in hand. Getting learning right at these times can give organisations an enormous competitive advantage, enabling them to be agile and adapt to new situations quickly. So what does right look like? Learning which is helping people become more agile works best if it is agile itself. This is not the time for lengthy modules, but for bite-sized learning that is produced quickly, in order to respond to changing conditions. Digital learning is ideal, as time out of the business is minimised and it is cheaper to deliver that F2F learning. 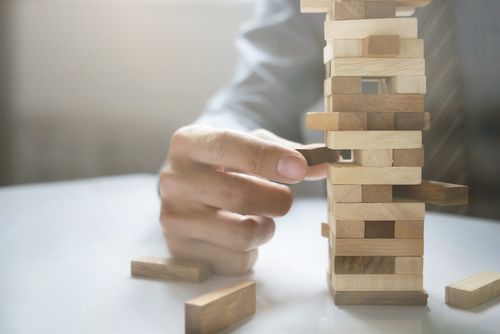 The bite-sized learning must be closely aligned to organisation goals. Learning can play a key role in communicating these goals and galvanising people to work towards them. Give people the opportunity to collaborate with each other. You’ll weather the storm better if everyone pulls together as a team. Look to your leadership team, not only as visible sponsors of the learning, but also to strengthen their skills. Good leaders become even more important in times of change. Clarity of job expectations, personal development, feedback, communication and relationships are all important drivers of employee engagement. All of these things can be enhanced or reinforced through learning. Engaged employees have been found to be up to 43%* more productive and 87%** less likely to leave their organisation. Greater productivity, agility, a positive, goal-driven attitude and being able to hold on to your best people is exactly what is needed when it all gets VUCAed up. **"Employee Commitment Remains Unchanged....". Watson Wyatt Worldwide. 2002. Retrieved 2006-11-07.